Polish-Americans are highly concentrated among the Great Lakes region of the United States, showing much less diffusion than some of the other ancestries I’ve looked at, like the Irish. Aside from their fairly specific geographic distribution, the Polish-American population doesn’t hold many surprises. I had thought there’d be more Poles, but one problem with preconceptions about ancestry is that there are so many different ancestries which make up the American landscape that it’s difficult to get a handle on all of them at once, as well as their relative prevalence. When I approach the end of this project, I do hope to put together a single map showing multiple ancestral/ethnic groupings at once — but I’m running into technical difficulties, and it remains a challenging work in progress. Cross your fingers for me! Native Sons – A map of Americans living in the state where they were born. Having seen an interactive the New York Times did recently looking at migration within the United States, http://www.nytimes.com/2014/08/16/upshot/mapping-migration-in-the-united-states-since-1900.html?WT.mc_id=AD-D-E-KEYWEE-SOC-FP-NOV-AUD-DEV-ROS-1101-1204&bicmp=AD&bicmlukp=WT.mc_id&bicmst=1414728000&bicmet=1451538000&ad-keywords=KeyweeCampaign&kwp_0=4807&_r=0&abt=0002&abg=1, I decided that maybe I should go ahead and share my own take on it. 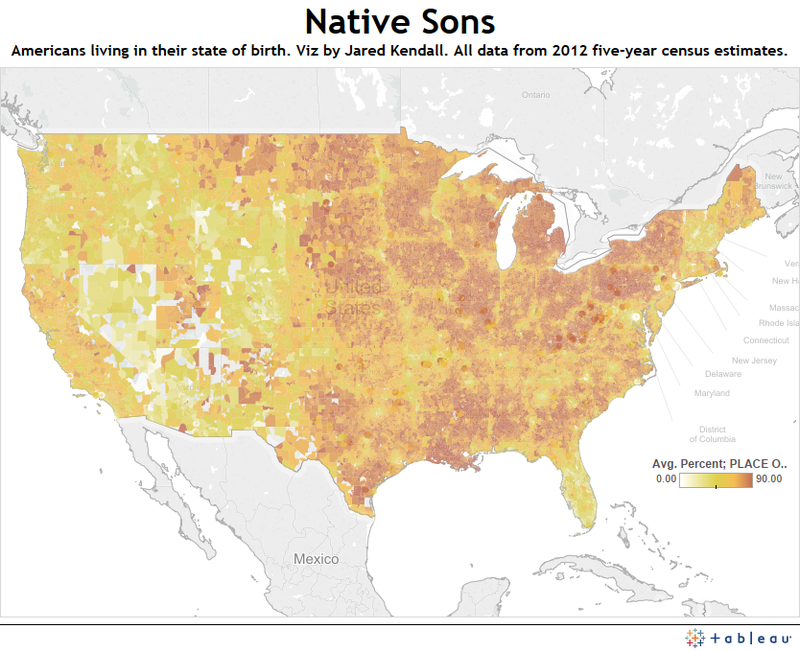 I looked at what I called “Native Sons” almost as soon as I started playing with the zipcode-level census data. The clear state borders you can see really stood out to me. Sadly, I didn’t think anyone else would be as interested in that… But from what I’ve seen of responses to the Times interactive, this is not the case. At least for Louisiana – one of the biggest homebodies of all the states. Born here, stay here, die here, apparently. Either the state is awesome, or we’re kind of timid/boring. The first thing that struck me when I made this map: What the heck is up with Chicago? Seriously, I had always thought Chicago was supposed to have an enormous Irish population – yet you just don’t see it on this zip-code level census data. Even poking around and mousing over individual zip codes in the area, I didn’t see much to explain the lack — no concentrated, 100% Irish neighborhoods, say. But, again, that’s why you do these sorts of projects. 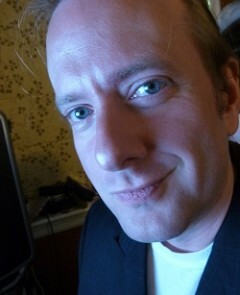 Surprise results are a good thing, as they help dispel illusions you previously labored under. The Irish are a wonderful group to study when discussing immigration, because they’re one of the more famous groups of immigrants to arrive in America and face opposition from those who were already here. The map is set so the darkest green (please forgive the stereotype I indulged in, using green to represent the Irish) represents zip codes with 25% or more Irish descent. 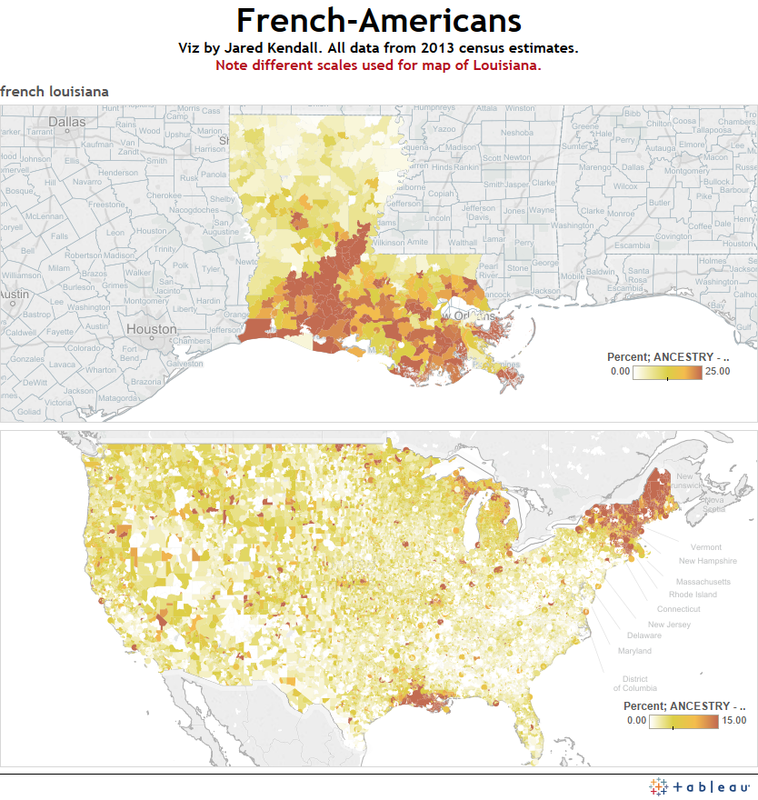 There are many more ancestral groups to cover, and I will keep putting together new maps for as long as I can find the time — keep watching jaredwkendall.com to see more of what makes up those who make up America. It being Thanksgiving, I think of Native Americans, among other things. It’s a carryover from my childhood, when the whole Pilgrims & Indians mythos was treated as gospel truth. Looking at their distribution, you can see Native American concentrations in modern tribal areas — Oklahoma, in particular, is easy to pick out. Other reservations and concentrations of Native Americans can be seen in the southwest, and parts of the northern Great Plains. Native American demographics weren’t included in the census dataset I used as my primary source. They’re included in files that look at race, rather than ancestry, and it’s a little weird to me that the two aren’t kept together. Race is about more than just race – it’s also about where we came from, and how we got where we are today. These maps help show both where we are now, and to some extent, I think they speak to how we got here, as well. Like many Americans, I’m a little hazy on my family tree. However, I’ve always thought of myself as predominately British, and assumed that as a former British colony, English descendents would be heavily represented when I mapped them. While America has plenty of English-Americans, they’re much more sparse than, say, German-Americans. This also brings up an interesting question – how much of these census results is attributed to actual lineage, and how much is due to variances in self-reporting? In other words, when you can count German, English, Welsh and Scottish relatives as part of your family tree, how do you choose to describe yourself? Perhaps claiming English descent seems too pedestrian, and loses out to the more “exciting” choices of, say, Scottish. To get true data, you would probably have to turn to genetic testing, and data from genetic testers that release demographic information can’t be trusted as being statistically representative of everyone – getting tested costs money, and requires an interest in such things. That’s going to skew results. For now, the census is as good as it gets, and I was quite surprised by this one. Here’s hoping I’m not alone – expected results can be awfully boring. Today I’m looking at one of the largest demographic groups in America’s ethnic background: The Germans. 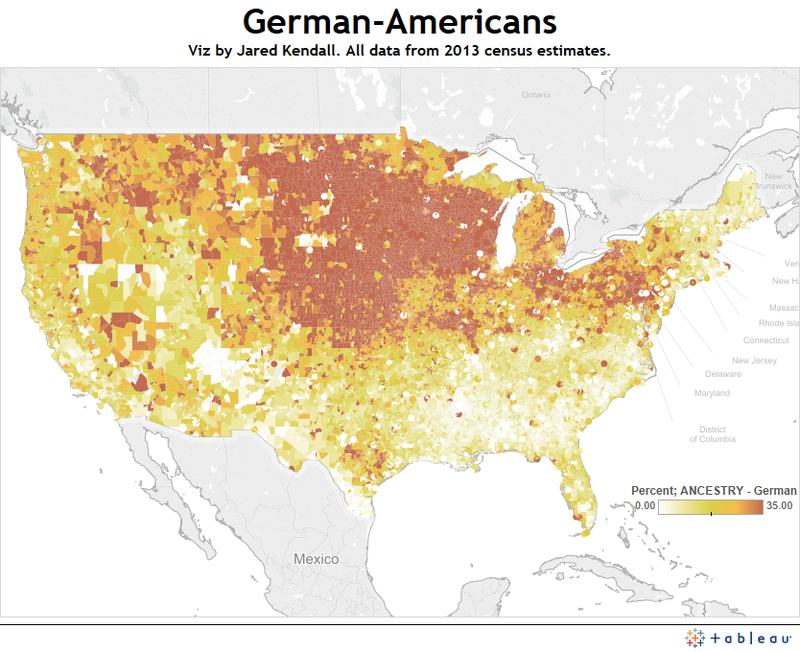 German-Americans are extremely prevalent across large portions of the nation. Unlike some of the other maps I’ve done in this series, Germans don’t show up in narrow patches or bands – they fill the map in massive numbers across large swaths of territory. As you can see from the map, a lot of us list German ancestry. The mid-west, in particular, seems to have held a special attraction for German immigrants.